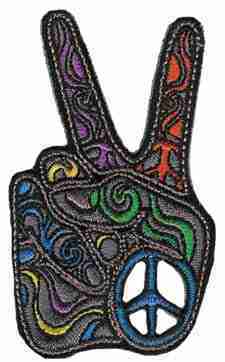 One of our most popular peace fingers stickers, now is available in a beautiful embroidered patch. This psychedelic peace fingers sticker was designed by Kathleen Kemmerling. It measures approximately 2" x 3 1/2" and can be ironed on or sewn on.